There are some mutations that allow a creature to be more effective doing what it does, and then there are just random things that happen. For example, there’s a certain penguin that eats like his mages, waddles around like his mates, socializes and hangs out and generally, does what all the other penguins do. 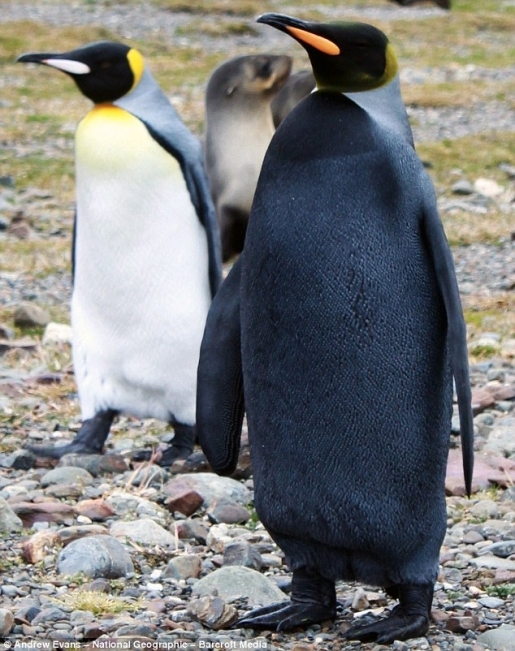 There’s one difference between this king penguin and the others: he’s entirely black. In a 1-in-250,000 shot, this penguin was born with melanism, a condition which has turned him from the familiar black-and-white tuxedo into an all-black funeral suit. While the condition has been noticed before, it’s rarely as eye-catching as this fellow is. Given that he’s survived to maturity, maybe his unusual coloration allows him to blend in better with the black sand beaches of Fortuna Bay, Georgia, where he was discovered. Whatever the reason, he’s survived this long and may soon find himself the father of a litter of more all-black penguin babies.